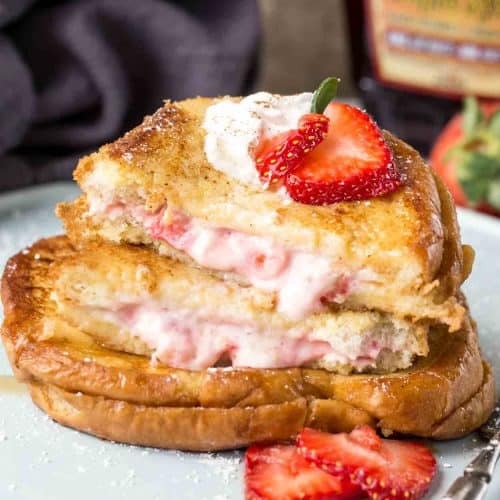 Strawberry Cheesecake Stuffed French Toast Recipe. 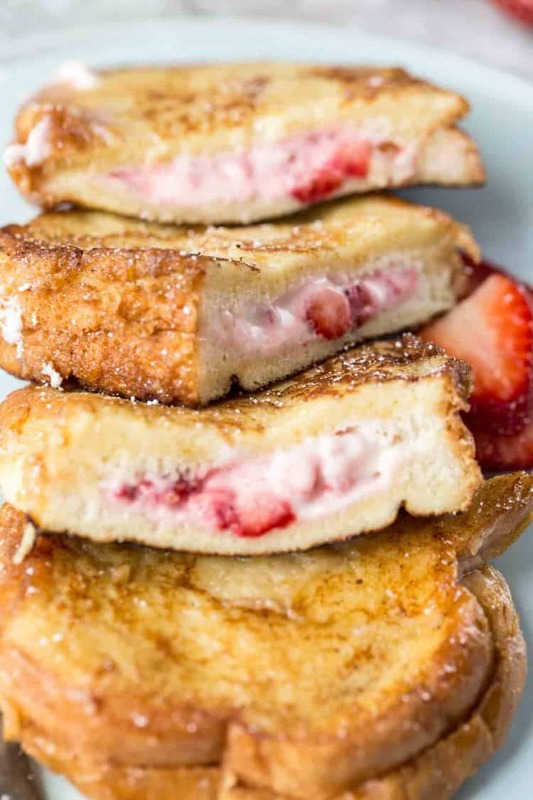 Classic french toast stuffed with a strawberry cheesecake filling. The perfect recipe for breakfast or brunch! Try these other breakfast recipes: The Easy Pancake Recipe, or the Pumpkin Spice French Toast, and amazing Ricotta Pancakes Recipe. Pin this recipe HERE! Follow Valentina’s Corner on Pinterest for more inspiration! Sometimes you want to have something more than a classic French toast recipe for breakfast or brunch. This cheesecake stuffed French toast is your solution. The chunks of fresh strawberries combined with cream cheese truly feels like you are having a fancy cheesecake for breakfast. The bread is dipped into an egg and milk mixture and cooked until bread is crispy and stuffing melts. Pure amazingness in EVERY BITE! Preparing stuffed French toast is so simple and the recipe is ready in under 15 minutes. In a mixing bowl, combine the cream cheese, vanilla and sugar. With a spatula, fold in the finely cubed strawberries. Spoon ⅓ of the filling onto a slice of bread. Top with a second slice and seal bread around the edges so the filling doesn’t ooze out. Repeat with remaining bread and filling. In a flat baking dish, combine the ingredients for the dipping egg/milk mixture. Set aside. Dip stuffed bread sliced into egg/milk mixture coating boat sides of bread, shake off any excess. Place dredged bread onto a plate. Add ½ Tbsp butter and ½ tsp oil to a large skillet over med/high heat. Once butter melts, add stuffed French toast to skillet. Cook French toast 2-3 minutes per side, flipping halfway through cooking. 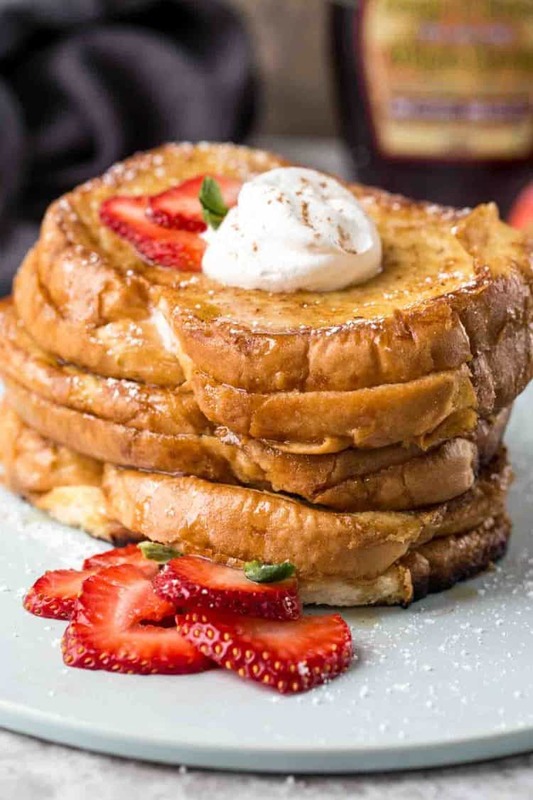 There’s not really much that can go wrong when preparing this easy stuffed French toast, here are some TIPS to ensure the best stuffed french toast. Don’t keep the bread dipped in the milk mixture too long, it will get too soggy. Quickly dredge bread and remove. The skillet cannot be TOO hot, it will burn the bread and not allow the cheesecake filling to heat. Skillet needs to be med/hot in heat. If you aren’t able to fit all three toasts into one skillet, clean skillet after the first batch of toast and before adding the second batch. Be sure to use thick bread slices or cut Italian bread loaf into thick slices. The French toast may be served plain, with maple/regular syrup or whipped cream. GETTING TO KNOW YOU: What’s your favorite topping for French toast? I’d love to hear about it in the comments below. 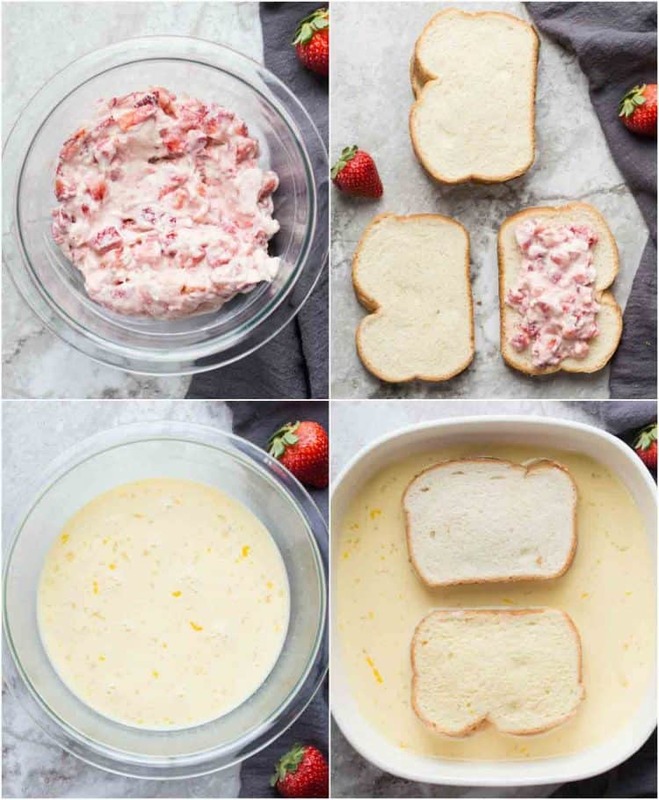 Strawberry Cheesecake Stuffed French Toast Recipe. 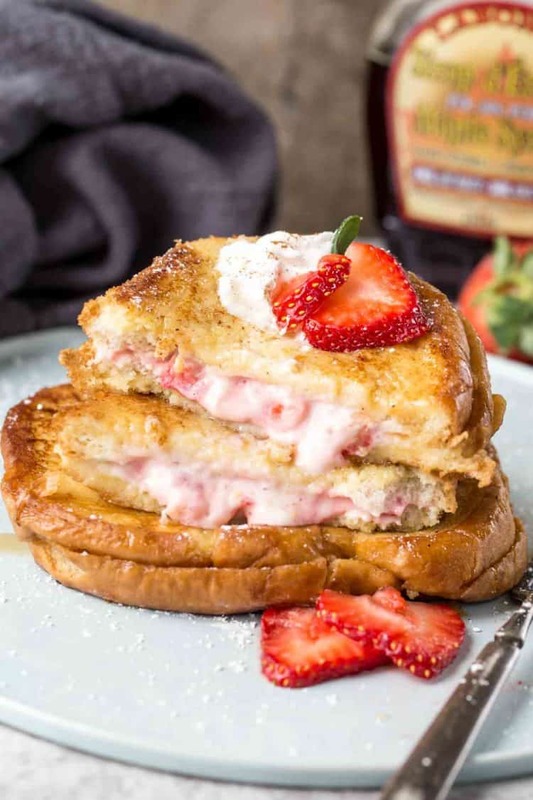 Classic french toast stuffed with a strawberry cheesecake filling. Cube the strawberries. In a bowl, beat cream cheese, vanilla and sugar. With a spatula fold in the cubed strawberries. Set aside. Combine all the ingredients for the egg/milk mixture. Spoon filling on a slice of bread and top with another piece of bread. Do this to three slices. Heat butter and oil in a large skillet over medium/high heat. Once hot, place french toast into the skillet. Cook 2-3 minutes per side, until a golden brown and crispy. Serve with maple or regular syrup, whipped cream or fresh strawberries! My wife and I are RV travelers and are always looking for a new twist on favorite recipes. We also have a small but fresh pantry, limiting fancy gourmet meals. I looked around this morning and saw strawberry, 2 hoagie rolls, some eggs and cream cheese. After finding your recipe, it all came together quickly and we had a delicious gourmet breakfast by Lake Okeechobee (FL). This is a keeper. Just made this! I absolutely love it and my husband does also ! It’s easy and delicious! I will be making this again ? Thank you for the wonderful feedback, Kayler. I’m so happy both you and your hubby enjoyed the stuffed toast. Thank you for taking the time to leave us a comment. I cannot wait to try these with a little bit of raw brown sugar sprinkled on top, our families favorite french toast topping!